Weeds? What weeds? Those are wild greens! But the lambs-quarter plants were getting huge and it was time to harvest them. After pulling the plants up, I began plucking off the leaves. From that big bunch, I ended up with about 11 cups of raw greens. I steamed them in three bunches and ended up with around 5 cups. I used one for dinner that night mixed with some Swiss chard from my garden and froze the rest in 1-cup bags. I’m going to use a couple of bags of the frozen greens this weekend to make a brunch dish for a baby shower. The mom-to-be is a vegetarian, so we’ve planned the menu to suit her. We’ll have two dishes from my new cookbook, Cooking the Wild Southwest: Delicious Recipes for Desert Plants. Our main dish will be Squares of Green, which is basically a quiche with greens and cheese. You could use a recipe you have or find the one in my book. We’ll also have French Green Lentil and Nopalito Salad, also in the book. To a base of French green lentils, which don’t fall apart when tender, we will add some sauteed nopalitos, chopped red pepper and green onions. It will be dressed with hazelnut oil and sherry vinegar. We will round things out with a fruit salad. The desserts we have planned are too decadent for me to own up to here. 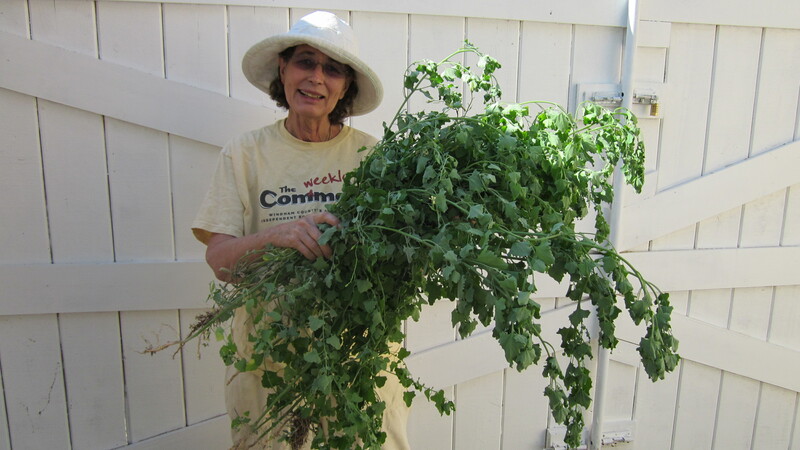 If you live in the desert, it is time to harvest any wild greens; anyone who lives further north or at higher elevation still has several months to go before your harvest.